Hungry? Tired? Need somewhere to sit, rest and get away? We can help you! 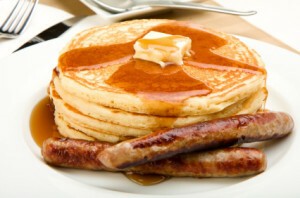 Visit the Pancake House where you can get a taste of delicious, freshly cooked pancakes and sausages smothered in our sumptuous locally produced, real maple syrup. Have hot or cold drinks, sit back, relax and visit in a friendly atmosphere. It is almost like old home day as we renew old friendships and make new ones with those who traveled many miles to enjoy the many vendors and entertainment lining our main street and arena. The Pancake House is the place to take a second breath before venturing out again. In the seven or so hours we are open, our over 100 volunteers make at least 6000 pancakes, cook as many sausages, perk many cups of coffee and smile at over 1800 wonderful guests. As you chow down on your pancakes & syrup, enjoy the entertainment. 9am on: North of 50 & Guests. Entertainment runs all day. 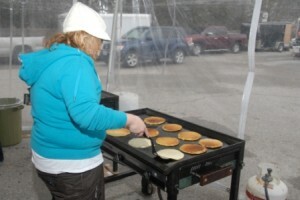 Includes: Pancakes, Sausage, and a Beverage of your choice (juice, coffee or tea) and Real Maple Syrup, of course!